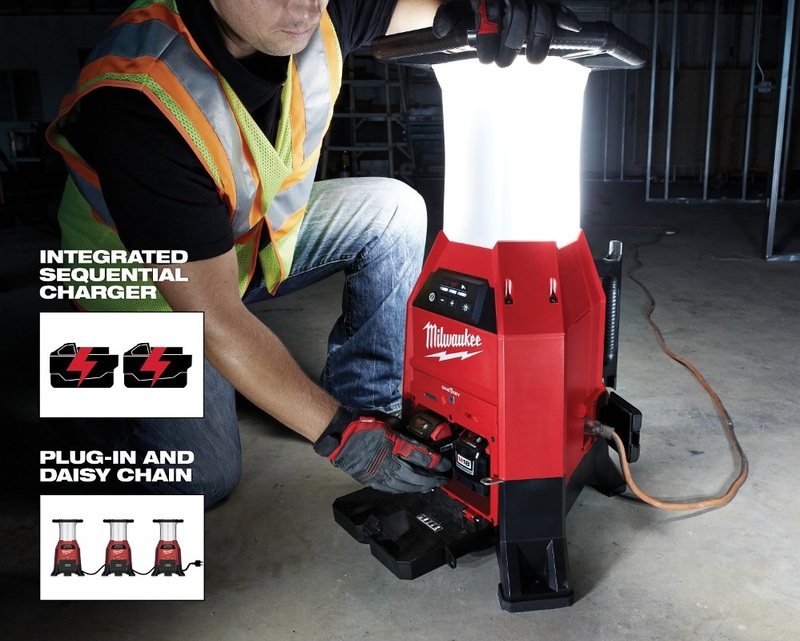 A powerful area light, bright task light or two-bay battery charger, the new Milwaukee Radius Site Light with One-Key does all of the above. 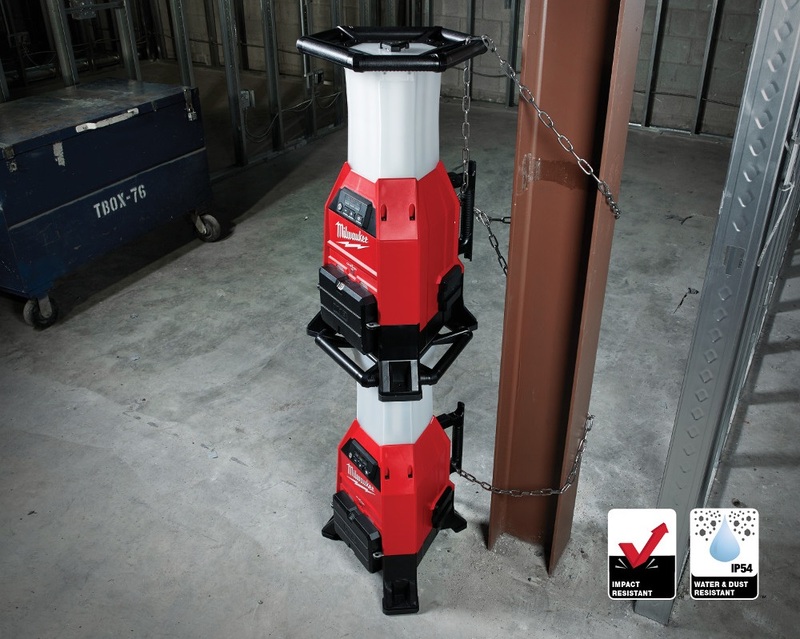 And with a high-impact housing and IP54 dust and water resistance rating, it can stand up to the perils of almost any jobsite. The M18 Radius Site Light delivers an impressive 9,000 lumens of Trueview LED light across 360 degrees, illuminating even the darkest rooms. Alternately, you can set the Radius Site Light to shine 180 degrees, an especially handy setting when you want to light up a specific task or ease up on the battery. Trueview LEDs produce light with a colour temperature that isn’t too warm or too cool. Rather, it’s optimized for clarity and comfort over the course of a long workday. Trueview LED light also represents colour accurately. 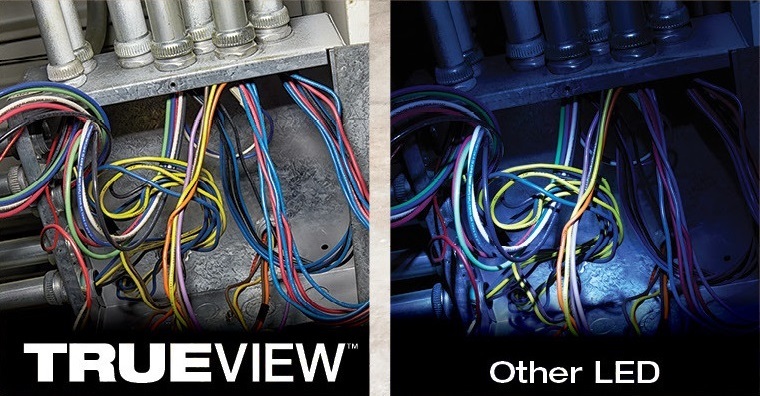 The image below shows a side-by-side comparison of Trueview LED light and an LED with poorer colour representation. The M18 Radius Site Light runs on either one M18 battery pack or two. 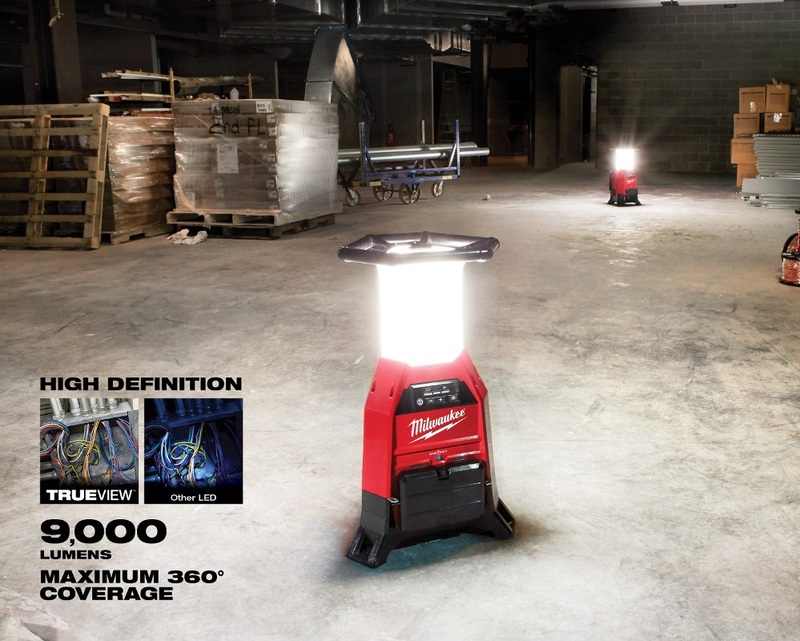 When running on two M18 9.0 Ah batteries, the Milwaukee Radius Site Light shines for up to 4 hours on High, 7 hours on Medium and 14 hours on Low. But sometimes the work must go on after the batteries have run dry. Fortunately, the M18 Radius Site Light also runs on 120 volt power, via a standard extension cord. And when things get really dark, you can connect up to eight Radius Site Lights in a daisy chain. Stack them up or string them out—multiple M18 Radius Site Lights can make midnight look like high noon. Plus, when you plug it in, the M18 Radius Site Light with One-Key becomes a two-bay sequential battery charger. Adjust brightness to suit the job or stretch out the battery life. Toggle between area light (360 degrees) or task light (180 degrees). Program a job-specific lighting schedule. Check status of a charging battery. Keep tabs on the whereabouts of the light. With a durable housing, high-impact polycarbonate lens and built-in carrying handles that double as its roll cage, the M18 Radius Site Light provides more than just powerful LEDs: It’s a reliable area lighting solution that’s rugged enough to handle dirt, dust, water and whatever else a jobsite can offer up. 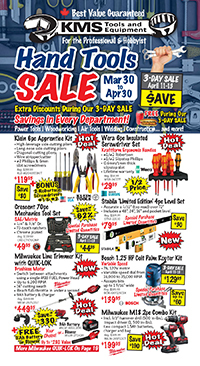 Stop by your local KMS Tools store, flip through the flyer, or visit kmstools.com to find the latest deals on the M18 Radius Site Light, as well as many other tools in Milwaukee’s M18 lineup. This entry was posted in Archives, Construction, Cordless Tools, New Tools, Power Tools and tagged cordless tools, main_page, Milwaukee, new tools, Power Tools by Your Friends in the Tool Business. Bookmark the permalink. Next → Next post: Magnum Garage Storage System: New Components Available!